It is a sad time and a horrible condition (Dementia). You have all the good times in your heart and like your dad you will never forget them. *I don’t like tae use a statement i don’t really like but in this case I will, I know how you feel. My mother knew who I was but couldnae remember my name. I was 3.5k away and crossed the atlantic regularilly, I remember say tae my auntie, her wee sister and my godmother, that I would be glad when it was all over, she replied “don;t say that son, you’ve only got one mammy”, she’s right but that wee woman sitting there was my mammy in name only by that time. Meant tae add that it was our da’s that introduced us tae Celtic but IMHO it was our mothers that made us. Sorry to hear about your mam’s situation – I’ll say a wee prayer mate. Garry the Tricolour is Massive and Flying High in Dumbarton. We will never be defeated. *and when they reached the Vennel they got an awful shock as standing there undaunted were the Fenian’s of the Rock, my uncle was one of them. Thanks for that. And apologies to PM! Maybe over-doing the neutrality a wee bit! He does look seriously miserable! 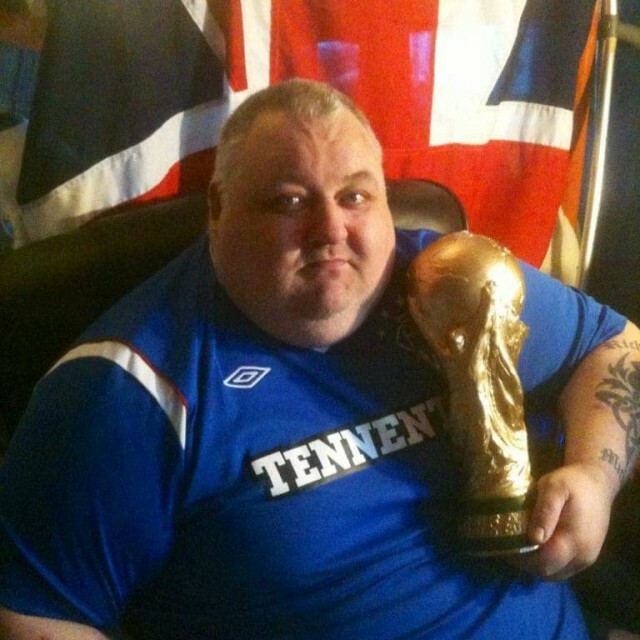 When I saw him looking away when Broonie got the cup I thought it was because he couldn’t stomach it. Now you have explained he’s working in security that explains a lot. Cheers again. You do tend to assume the worst any time that organisation is involved. Who would win in a fight between Steve Coogan and Tim Pat Coogan? DD- sorry for your situation, i might be in the minority here,but a when folk get to a certain stage,if the family agrees,a wee jag and a kiss goodbye would be much more humane, and ease the pain for everyone. That certainly sounds reasonable. And, sooner or later, it may be on the cards. But, if legal, it would be open to abuse by the state and by individuals. The old are costly for the state and often inconvenient for relatives. So, it might be difficult to identify the real beneficiary of ‘mercy killing’. And my grandfather was another. Mercy killing occurs more often than we think it does, morphine is just not a pain killer but also a death accelerator, the dosage can be upped when the needs justify this. If that law comes into place there would a lot of people given the jab,which would be unlawful, in the eyes of many. About 18 years ago I was in hospital because my intestines stuck to my stomach,and they thought that I wouldn’t survive the operation,I was given the last rites,My sister in law told me this about two years ago, 18 years on I’m still here, but with the law that you are discribing, I wouldn’t have been,hope it isn’t passed. I happened to meet Steve Coogan a couple of times – in both cases he was quite a cool dude, bright and very approachable, his humour understated and quiet. The first time was in a new private members club in London, the second years later at a film festival in Schull. Both times I left with a very good impression of him – a solid bloke and someone good to have a pint with. In other news- I’m watching The Miami showband massacre – in Ireland in 1975, very interesting. Full time EKFC 0 Cumbernsuld 0. So title celebrations delayed till Tuesday and another home tie against Spartans. Good game though. Sounds like Dedryck could well be out of the huns game . Hopefully Filip and Kris will return unscathed. Kieran Tierneys fav player is Dianbobo Balde. A great insight into the young Mans thinking. Noone gets past Kieran, he is pretty good going forward too!!! Lustig, off injured playing for Sweden. CQN down 1-2 to ross county on alba. Didny even know we were playing, and why wasn’t I asked? You may not be the oldest poster on Cqn but you are the eldest statesman because of your longevity on this dear place..
I’m glad you called,it cheered me up tremendously, you cheered me up that much I’m actually tidying up my house, something my body wasn’t fit enough to do before you called, you brightened me up no end. Looking forward to meeting up soon, wee bevvy come to mind. cheers Stephen. You should thank your lucky stars yer no a wummin, with all these recent falls you’d most definitely be pregnant by now, always confused me that, we bruise and break when we fall and they get pregnant. Anyone know what the story is with Tierney? for the last 5 or 10 minutes of the game last sunday KT was fooked. Aye i was surprised when i heard he was in the Scotland squad. Think KT resolved any of the guff around his condition……………rest will sort it. The surgery thing was pish, apparently. Kudos to the young superstar Tim for turning out for Scotland……….he’ll get no thanks from huns……. As KT is a very , very valuable asset of Celtic and a fundamental fixture our Our Club, I ‘d expect him to be the subject of sleekit guff between now and The Untainted Ten. The Bhoy clarified it himself………………….. Rest sorted it. I’d imagine the professional game at whatever Level requires a basic match-fitness that we can only marvel at. Here’s hoping all Tims return safe and sound from the International hiatus. come on bhoys, my late father would be 90 years old today, alas he was only 53 years old when cut down by that horrible disease lung cancer, so im asking for the missing names in the team he always taught me, his team, I can remember geatons lyons and Patterson kennoway hogg and morrison and that’s all. any help appreciated, is tontine tim about.hh.